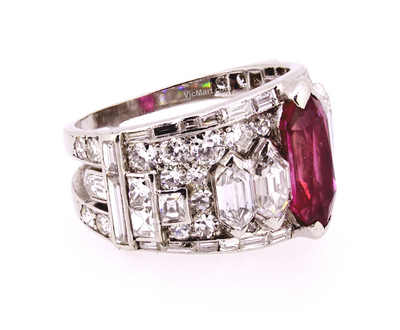 Item description: * CARTIER Paris Art Deco c. 1925 Platinum Ruby and Diamond Ring. Property of a well known lady. 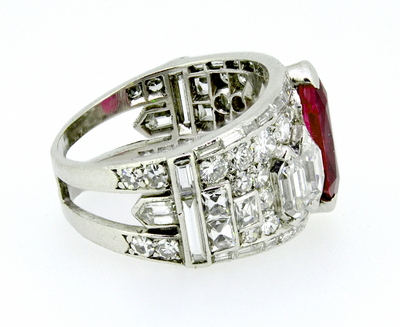 An extraordinary Cartier Art Deco period creation of emblematic geometrical design in platinum, the ring crafted in a cascading stairway like setting and covered by a total of 68 round brilliant, baguette and fancy shaped diamonds. 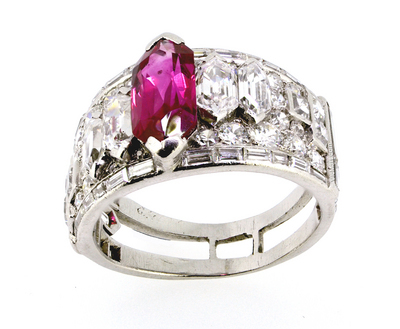 Total estimated diamond weight is approximately 5 carats, while the very centerpiece of the jewel is a fine natural and unheated / untreated Burmese ruby set atop. The perfectly clear (a typical VVS grade for a Type II colored stone) Mogok mine Burma ruby displays a fancy shaped hexagonal cut with an approximate weight of about 2 carats. The exact types of diamonds set throughout the ring, are as follows: -28 round brilliant cut diamonds claw set on both sides of the ring, having various diameters that are ranging from 2mm to nearly 4mm and estimated combined weight of about 1.4 carats; - 6 fancy shaped square carre cut diamonds bezel set, measuring 2.5mm x 2.5mm size and having an estimated combined weight of 0.60 carats; - 26 baguette cut diamonds channel set along both the sides of the ring, having various lengths ranging from 2mm to 3mm and about 1.5mm wide, with an estimated combined weight of 0.62 carats; - 2 fancy extra long baguette diamonds, again channel set on both sides, measuring 6mm x 1.5mm and weighing a combined 0.30 carats; - 2 fancy shape epaulette or bullet step cut diamonds, bezel set on both sides with an estimated combined weight of approximately 0.24 carats, - 4 larger fancy shaped hexagonal step cut diamonds, that are set into large two claws settings, two of the diamonds being 7mm x 4mm in size, while the other pair being 6mm x 3mm and having an estimated combined weight of 1.8 carats. 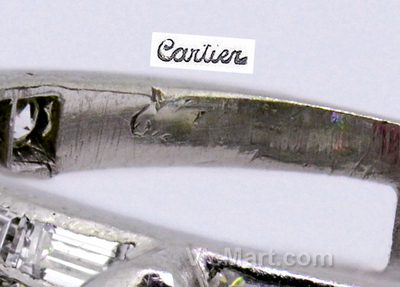 The ring is indistinctly signed Cartier with an additional faintly scratched custom order or inventory number that possibly reads R3492 at the shank’s inner side towards the base. 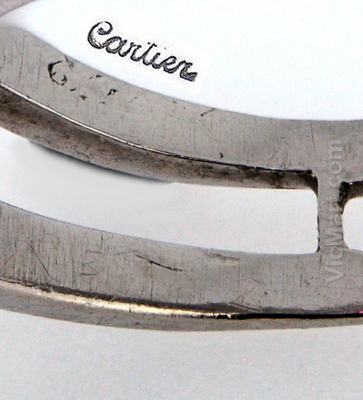 Further to these, there is another faint, but noticeable scratched signature that looks like a hand signature of 3 letters or initials, which could read “LAC” or “LEC”, or other similar abbreviation which could possibly stand for Louis Cartier or another Cartier firm’s designer or master goldsmith. 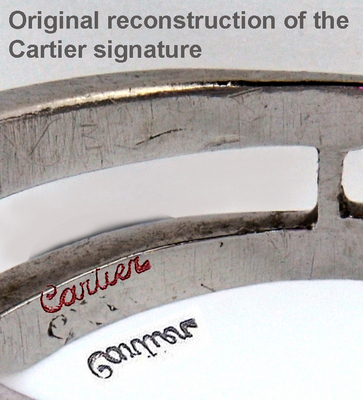 The Cartier signature is rather worn off and obscure, but the first letter “C” and part of the “t” are very clear and undoubtfully were part of the Cartier signature mark. On the other side of the shank’s inner circle there appears to have been some letters, but those are nearly completely worn off, although most likely used to read “Paris”. The inner circle of the ring is slightly oval shaped with dimensions of 18mm x 17mm across and the outer diameter of the ring is approximately 22mm and 8mm wide at its widest points. Gross weight of the ring is 9.5 grams. The slightly oval shape could have either been the original design or the ring might have been resized during the years – hence the wearing off of large parts of the signatures and marks. 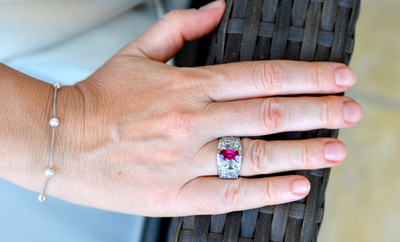 The ring is most certainly a 1925 piece and part of Cartier’s best creations, that were produced and displayed while exhibiting at the Paris Art Deco Exposition or another special custom order before or right after the time of this famous EXPO. Art Deco derived its name from the World's fair held in Paris in 1925, formally titled the Exposition Internationale des Arts Dйcoratifs et Industriels Modernes, which showcased French luxury goods and reassured the world that Paris remained the international center of style after WWI. Art Deco did not originate with the Exposition; it was a major style in Europe from the early 1920s, though it did not catch on in the U.S. until about 1928, when it quickly modulated into the Streamline Moderne during the 1930s, the decade with which Americanized Art Deco is most strongly associated today. Paris remained the center of the high end of Art Deco design, epitomized in furniture by Jacques-Emile Ruhlmann, the best-known of Art Deco furniture designers and perhaps the last of the traditional Parisian йbйnistes, and Jean-Jacques Rateau, the firm of Sьe et Mare, the screens of Eileen Gray, wrought iron of Edgar Brandt, metalwork and lacquer of Swiss-Jewish Jean Dunand, the glass of Renй Lalique and Maurice Marinot, clocks and jewelry by Cartier. Art Deco was an innovative design style popular in the 1920s and 1930s. Its sleek, streamlined forms conveyed elegance and sophistication. It was the age of the Flapper, the Jazz and the Machine Age. Materials used ranged from rubies, gold, and pearls to plastic, chrome and steel. 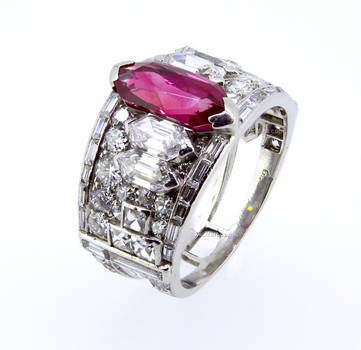 Platinum was the new luxury metal used with opaque stones like coral, jade, onyx and lapis lazuli. Costume jewelry became even more popular and outrageous. Trend-setting couturiers were Coco Chanel and Elsa Schiaparelli. Influences were Pharaonic Egypt, the Orient, tribal Africa, Cubism, Futurism, machines and graphic design. However, jewelry of the 1920's and 30's was in thrall to geometry: circles, arcs, squares, rectangles and triangles and so on. Renй Lalique, who created glass jewelry in the 1920's and 30's, created romantic designs from nature. 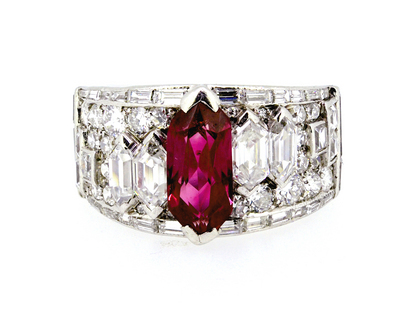 The Cartier firm, founded in 1847, reached dizzying heights of Art Deco splendor under the direction of Louis Cartier (1874 - 1945). 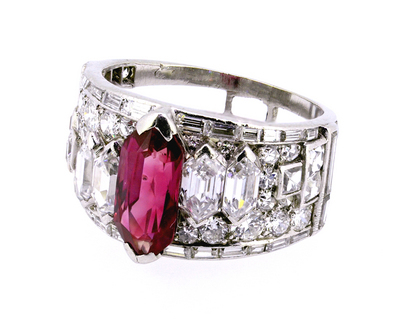 His fascination with exotic motifs led to the creation of diamond, ruby and platinum jewels of unsurpassed design and quality. The present piece of antique jewelry is LIFETIME GUARANTEED AUTHENTIC and upon additional request we can accompany it with our company’s COA and appraisal certificate. 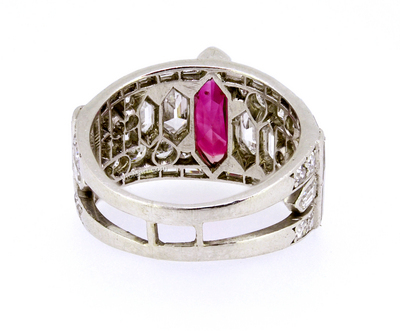 Undoubtfully important Cartier Art Deco platinum ring with similar pieces seldomly seen offered for sale at auctions. For comparison and reference, one could review a number of similar by design Cartier c1925 Art Deco period brooches and pendants that were featured at some of the major Sotheby’s and Christie’s auction sales, as well as couple of other brooches offered at the “Exceptional Jewelry from the Estate of Francoise Hermann” auction sale held by Bonhams & Butterfields in April 27, 2004.